Whilst Sky Bet isn’t the biggest online bookmaker in the world, they do have the backing of one of the biggest companies in BskyB. The television broadcasting company have managed to add another string to their bow in terms of betting. 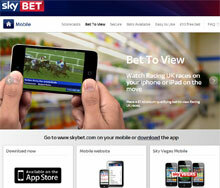 The latest addition to their site comes in the form of the beautifully designed Sky Betting app. The betting app allows punters to access a host of betting markets; in fact the app is basically a diluted version of their ever increasing betting site making it an ideal addition to their portfolio. There are few companies that have the readymade marketing options that a company like Sky Bet has, mainly down to the integration of their huge satellite television company. New users to the Sky Bet app can take advantage of one of the best free bet incentives in the industry. A £10 free bet is on offer for all users which requires no deposit whatsoever. All you need to do is follow the link below, register a new account and this account will be credited with a £10 free bet to bet on anything you choose. Any winnings from the bet you keep, but you do not get to keep the original stake. For players on a limited bankroll then is a great way to start your Sky Bet experience with no outlay. On top of this you can earn an additional £5 free bet when you deposit and place a bet of at least £5. If you place a £5 bet every week then Sky Bet will give you the same free bet for the remainder of the English football season. On top of this if you bet £10 a day you will earn loyalty stamps. For every 5 stamps in the calendar moth you will receive a £5 free bet up to a maximum of £20 per month. The betting app is available in some form on pretty much all smartphone and tablet devices. iPhone and iPad users can download the app directly from the Apple storewhilst other users on Android, Blackberry, Nokia and Windows phones can simply go to www.skybet.com and they will automatically be redirected to the Sky Bet betting app. For those of you familiar with Sky and in particular Sky Sports, the betting app definitely follows that sort of glossy, 3D effect theme without ever being brash. There’s only a couple of colours –blue and white – throughout pretty much all the app which actually makes it very simple to use. Simplicity is definitely the key word with the Sky Bet app and it’s this that makes it so easy to use and keeps loading times at a minimum. One of the best integrations with the Sky Bet app is the inclusion of Racing UK allowing you to stream live horse races through a 3G/4G or Wi-Fi connection. All you need to do to get access to each race is have a minimum bet of £1 for that specific race. Whilst the betting app is great to use it’s the fact that it links in with so many Sky Sports products that makes it feel a lot more than simply a betting app. You can easily access the likes of Sky Sports News, Football Score Centre, Cricket Score Centre and even Sky Go straight from the betting app. Sky has worked hard on producing a betting app that is going to compete in a competitive market place. They have managed to do this with great success and their betting app is easily one of the best in the market. To be honest, anything less from Sky Bet would have been a disappointment given that they likely have more resources than the majority of big betting sites. Simplicity has been the key with this app, but it’s taken time to get it right. The colours look superb, usability is up there with the best and, possibly more importantly, market coverage and sports are also excellent. Visit Sky Bet – £10 Completely Free Mobile Bet!